So, Pokémon Go has taken the world by storm. 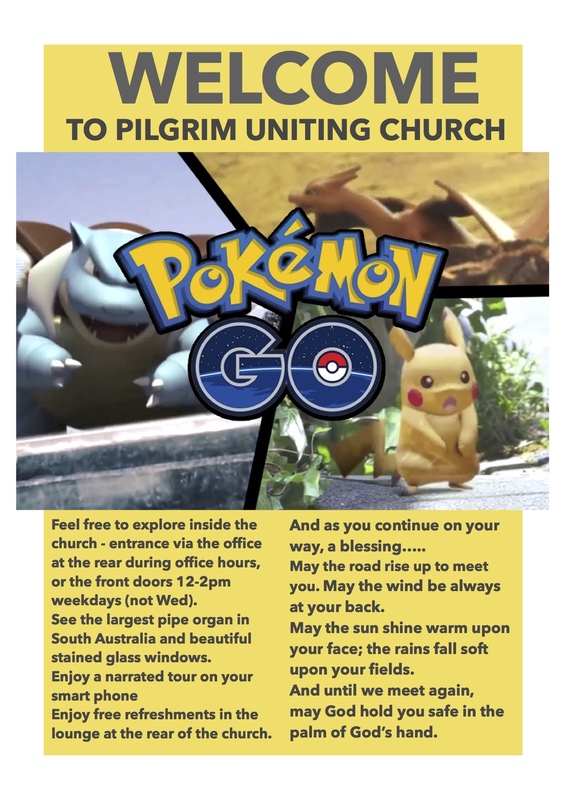 We’ve spotted quite a few people around Pilgrim Church playing Pokémon Go. We’ve put up a welcome sign at the front, inviting people to look inside the church and enjoy refreshments in the lounge, and a blessing to send people on their way. It’s a limited but intentional interface with people who chance upon Pilgrim Church because the game has led them there. In some places Pokémon Go has been banned because the game lets players “evolve” their captured Pokémon characters. That means players can make the characters bigger and stronger by using points they earn by playing the game. And that could be deemed ‘natural evolution’ and the reason religious officials have decided there is no place for Pokémon Go in the Arab kingdom. In some places, people too busy with ‘real life’ pay other people to play the game for them. Others are using Uber-like driving services with the promise of taking players to some of the hottest Pokemon hunting grounds around the city. In Syria, a media agency run by activists is capitalizing on the Pokémon Go craze to plead for help for children inside the war-torn country. The campaign is asking gamers to take a break from hunting for digital creatures and instead turn their attention to helping Syrian families trapped in war zones. 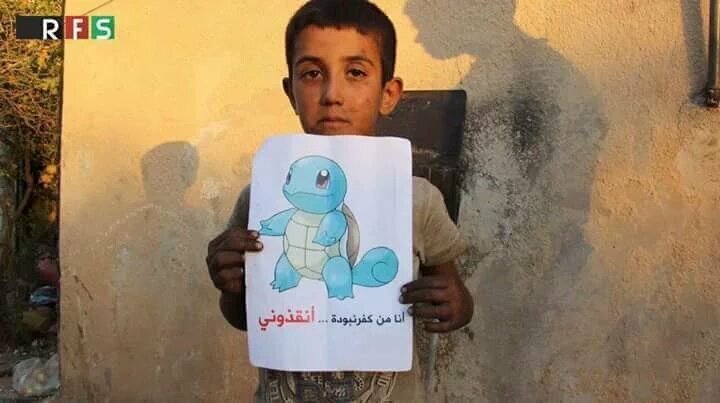 Children are pictured hold signs in both Arabic and English with a Pokemon creature. 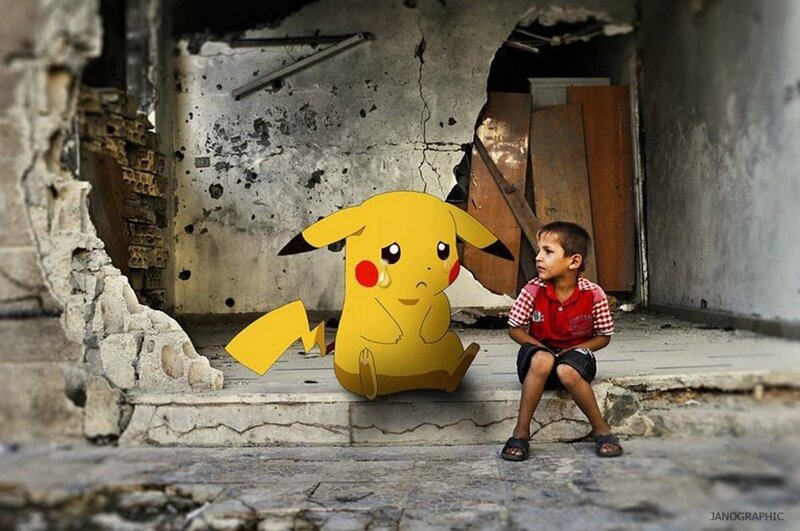 One tweet shows a boy in an unknown location in Syrian, sitting in rubble on the street with a crying Pokemon next to him, with the caption, “I am from #Syria come to save me!! !”, and the hashtag #PrayforSyria. Can we be people of faith AND reasonable people? In dilemmas, distinctions are always helpful. Here it’s a matter of making the distinction between belief and faith. The possibility of this historical moment is that of a new, third period in Christianity that Cox calls the Age of the Spirit. “We cannot and should not try to reinstall the first Age of Faith. We live in a different world. But Christianity today bears within it both the cherished gems and the worthless debris it has accumulated during the intervening years of the Age of Belief, which is now expiring. Can we perceive the jewels and get rid of the junk,” asks Cox. Australian author David Tacey is on about that project – perceiving the jewels and getting rid of the junk. Again, it’s a matter of making a distinction between belief and faith. In his book Religion as Metaphor: Beyond Literal Belief he writes, “If religion is seen as ‘belief in impossible events,’ it hardly has much of a future in an age of science. Faith, however is a different matter.” For Tacey, faith is what religion points to; a window not a wall. Metaphor and myth lead us to deeper places as long as we don’t get stuck on the surface of the stories of faith. and ordinary people can, will, and do survive.